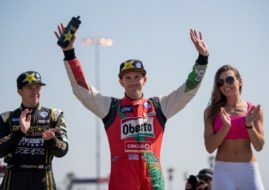 Nelson Piquet Jr. (SH Racing Rallycross) earned the first victory of his Red Bull Global Rallycross career in Saturday’s race at Washington DC. In the final race he was faster than Patrik Sandell (Bryan Herta Rallysport) and Ken Block (Hoonigan Racing Division). All three were driving Ford Fiestas. Piquet’s victory was a little revenge for last year’s defeat at the same track, when Sandell was first and Piquet second. Piquet’s victory was also the first for SH Rallycross, and came on the end of a nearly perfect weekend. He turned the second-fastest lap in qualifying, won both of his heat races, and claimed a victory in the semifinals to earn lane choice on the grid. 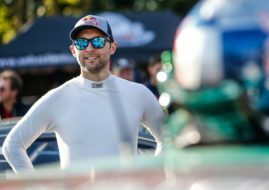 The victory also allowed him to jump from sixth to third place in the Supercar championship standings with five races remaining. For Ken Block, who finished third, this is fifth podium finish in seven races of the 2015 season. The result extended his Supercar championship lead to 41 points over Sebastian Eriksson (Red Bull Olsbergs MSE). Steve Arpin (Chip Ganassi Racing) and Tanner Foust (Volkswagen Andretti Rallycross) completed the top five. 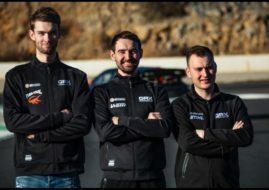 12 drivers competed in Washington DC, classification of others are: 6th Sebastian Eriksson, 7th Scott Speed (Volkswagen Andretti Rallycross), 8th Austin Dyne (Bryan Herta Rallysport), 9th Jeff Ward (Chip Ganassi Racing), 10th Joni Wiman (Red Bull Olsbergs MSE), 11th Logan Gomez (Royal Purple Racing), 12th Pat Moro (PMR Motorsports). “Thanks to my team—they’ve been making the car quicker and quicker every race, and we’ve just been getting more and more competitive. Patrik kept it clean the whole race, and I think that was a bit of a thank you from last year, when we were battling together, he finished first and I finished second. All of our sponsors have been supporting us for such a long time, and they deserved a win. Hopefully this is just the first one.” Piquet said. In GRC Lites, Alex Keyes rebounded from mechanical issues that kept him out of the previous event in Detroit to win his second event of the season. Keyes held off Oliver Eriksson for the victory, while new Lites points leader Miles Maroney claimed third. Next race of GRC season will be Red Bull Global Rallycross Los Angeles presented by Subaru Tecnica International. It will take place on September 12-13 at the Port of Los Angeles.